The original drawing from the patenting of The Waiter's friend in 1883. 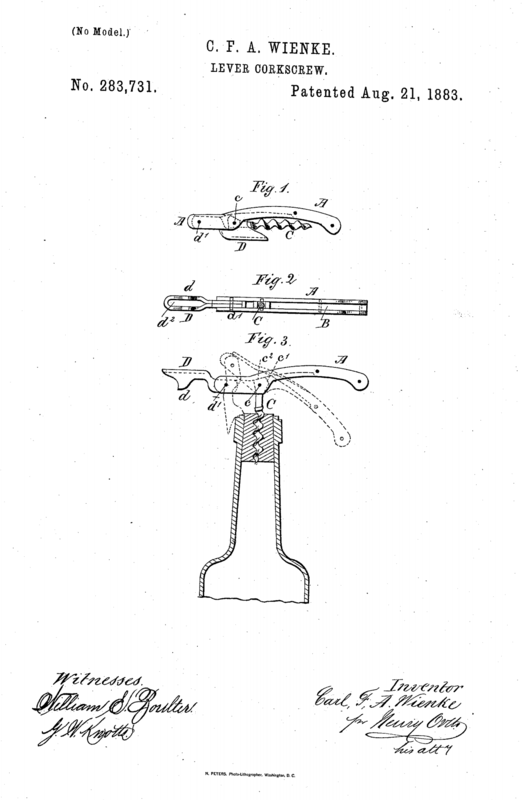 The following is a blatantly open and completely undisguised tribute to the design of the Waiter’s Friend corkscrew. It is simply the ultimate working tool. For all I care, you may prefer any kind of corkscrew, that suits you the best. But if you ask me to pick one favourite corkscrew design, it’s a no brainer to me. 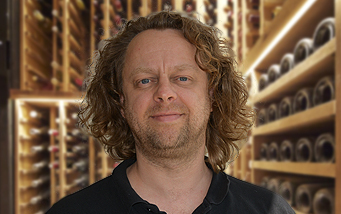 As a professional with a background from both the hospitality business and the wine trade, I have no doubt when pointing out the best corkscrew: The Waiter’s Friend. It’s handy. It fits easily in the pocket, it’s easy to use and last but not least; it works like a charm each and every time. There truly is a myriad of other corkscrews to be found out there, but it’s always the Waiter’s Friend that I keep coming back to. First and foremost, it’s a tool that constantly has proven its worth through time. Since its invention and patenting in Germany in 1882 very few changes have been made to the original design. A good Waiter’s Friend is a bit similar to a pocket knife. The great thing about this exact kind of corkscrew, is that you have all the necessary functions in the palm of your hand, and nothing else. This kind of corkscrew has its name for a reason. Waiters love it! It’s a brilliant tool preferred by professionals, and if you are looking for a good cordless drill, a carpenter is a good one to ask for advice. Let’s have a look at what it is that makes a Waiter’s Friend so good. The screw has been replaced by a spiral, and that is an absolutely brilliant improvement. A good corkscrew is holding a spiral instead of a screw, because a screw will easily destroy the cork. Therefore: you should go for a corkscrew with a spiral, preferably a Teflon coated spiral. The knife, or the foil cutter is preferably in a curved shape, allowing it to cut nicely along the bottle’s rounded neck. A regular foil cutter is useless when opening bottles sealed with wax. A knife is always more versatile. If the lever arm at the end is a two-step version, it’s the best, because this way you can lift the cork in a more stable and vertical movement. A constantly award-winning corkscrew is the Waiter’s Friend. In all professional wine and food related media tests have been carried out, and sommeliers, bartenders, waiters, vintners and the likes unanimously declare their full support to the Waiter’s Friend. So, you can easily say, that based on a solid empirical ground, it is safe to appoint The Waiter’s Friend the best corkscrew in the World!